Moore family from New York (Charles Carroll Moore (1827-1902), Jacob Bailey Moore (a brother of Charles) and Frank Coddington Moore (1864-1929, a son of Charles), are holders of 3 US and 1 German patents for calculating machines (Jacob Moore was a holder of another US patent from 1868 for window-shade fixture (Pat. No. 75446), and Charles Moore was a holder of US patent from 1873 for a curtain-fixture (Pat. No. 145359). 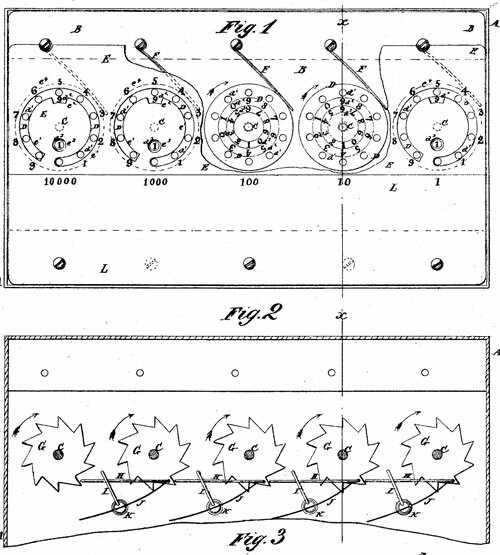 The first patent for calculating machine, (US152670) from 1874, granted to Charles Moore and Jacob Moore, was for a Pascaline type adding machine (see the patent drawing below). The machine is a simple five-positional adding device, nothing more of the earlier machines of Lepine and Boistissandeau. In using the machine, the instrument for turning wheels is inserted in the hole of the wheel D, opposite the digit of the scale e4 that represents the number to be added, and is moved around to the right until it strikes the stop. The units, tens, hundreds, etc., are added by turning the proper wheels. In turning either of the wheels D, as each ten of the column of figures being added is reached, the next wheel is turned one space, the carrying being thus done automatically. 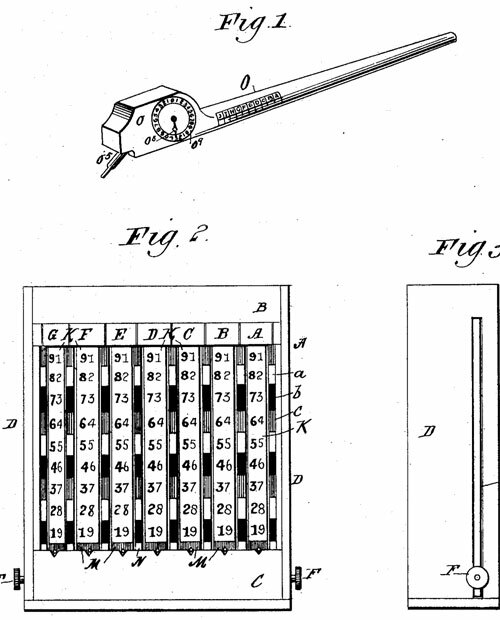 The next calculating machine of Moore family was patented in June, 1888 (see the lower patent drawing). The US patent (US383973) was granted to Charles Moore, assignor to Jacob Moore. The same device was described in German patent (DE47640), which was granted to Frank Coddington Moore, the son of Charles. The second calculator of Moore is somewhat similar to the earlier Arithmetical Machine of Christian Ludwig Gersten. Addition upon this machine may be commenced at either figure of the sum desired to be put on the machine. For example, to commence with 375, add 5 first by the units rack, 7 by the tens-rack, and 3 by the hundreds-rack, or, vice versa, add 3 first on the hundreds~rack, then 7 on the tens-rack, then 5 on the units-rack; or even add 7 on the ten-rack first, thus commencing anywhere, but with care that the figures are put on by their respective rack-namely, the units by the units-rack, the tens by the tens-rack, the hundreds by the hundreds-rack, the thousands by the thousands-rack, and so on undefinitely. A special feature of this machine is that it has an "apparent carrying" and an "actual carrying", principle, believed to be new in adding machines (although some kind of gradual carrying, was implemented in the earlier machines of Pascal and Chebyshev), in order to avoid the serions obstacle in these machines known and commonly termed as "the nine holes"—i.e., for example, to add l to 90999 to produce and show 100000. The apparent carrying is when at the instant a 10 of any disk has arrived at an opening the plates G G', etc., are moved downward automatically, covering said opening and concealing the figures therein by an apron, and at the same time locking the adjoining disk-rack. The actual carrying is when by the thumb-pin, or automatically by the revolution of the disk, the plates G G', etc., are moved upward, lifting the apron from the opening to show the figures therein, unlocking the adjoining disk-rack, and by the pawl J now actually adding one to the adjoining left hand numbering-disk. Between the downward and the upward movement of said plates G G', etc., the actual carrying is thus interrupted by a period of rest, which may continue even to the instant before another one on the same disk is to be carried. 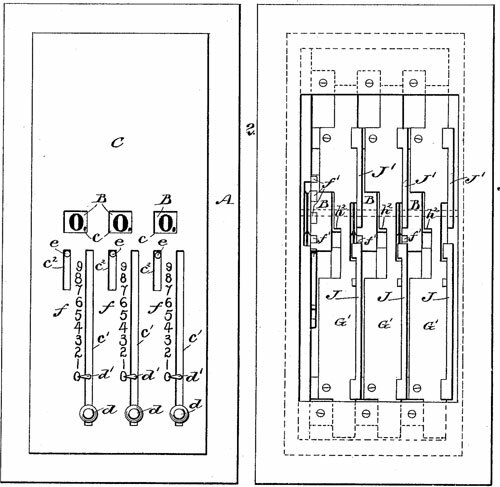 The last calculating machine of Moore family was patented in January, 1899 (see the lower patent drawing). The patent (US618427) was granted to Jacob Bailey Moore. The third calculating machine of Moore consists of an automatically-carrying pointer (Fig. 1), and a device for performing addition or subtraction (Fig. 2). The adding device consists of movable or sliding and numbered tapes or bands designed in performing a problem to be operated by the pointer which automatically registers and indicates the tens to be carried. The main frame has movable sections to be employed in performing examples in multiplication and division, said sections being spaced, numbered and lettered. There is some information about Moore family, although it is scant concerning Charles Moore, who seems to be the main driving force behind the above-mentioned patents. Charles Carroll Moore was born in Concord, New Hampshire, on 17 July 1827. 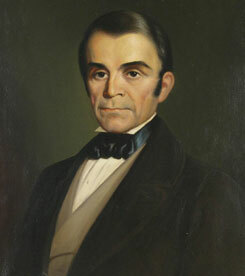 He was the second son of Jacob Bailey Moore (see the nearby portrait), and Mary Adams Hill. Jacob Bailey Moore (31 Oct 1797—1 Sep 1853), the son of the physician Jacob Bailey Moore (1772-1813), though without a college education, acquired considerable knowledge of classics and was noted for his love of reading, music and mechanical ingenuity. In 1813, at the age of 16, having his father died, Moore had apprenticed himself to Isaac Hill, the owner and editor of a newspaper at Concord (later Isaac Hill became US Senator and Governor of New Hampshire). He became Hill's partner in 1819 and on 28 August, 1820, he married Hill's sister, Mary Adams Hill (b. 1800). In 1823 Hill and Moore dissolve the partnership, and Moore became a printer, bookseller and publisher. From 1830s he was sheriff of Merrimack county, editor of a newspaper in New York, chief clerk in the Post-Office of Washington, D.C., librarian and publisher in New York, and the first postmaster of San Francisco in 1849-1853. Jacob Bailey and Mary Adams Moore had four sons and two daughters: George Henry, Charles Carroll, Jacob Bailey, Frank, Lucretia and Mary. George Henry Moore (April 20, 1823—May 5, 1892), LL.D. from University of New York, became an American historical writer and librarian. Jacob Bailey (b. 1829) graduated from New York University in 1851, with high honors, and later, just like his father and brother George, was librarian of New York Historical Society. Frank Moore (1828–1904) was an American journalist and writer, the author of quite a few books, among them The Rebellion Record, 12 volumes reporting on the American Civil War. On 29 Jan 1861 in New York Charles Carroll Moore married to Maria Haines Coddington (1836-1867). They had 3 children: Jacob Bailey (1861-1861), Mary Mathilda (1862-1925), and Frank Coddington (1864-1929). Charles Carroll Moore passed away on 3 July 1902 in Savannah, Georgia.